Wondering what clouds mean in dreams? Do you notice clouds often as a sign and symbol in your daily waking life? Understanding what clouds can mean can give you a lot of insight into what is happening in your life that you should pay attention to! In general, dreaming of clouds often occurs in situations where the dreamer may need to have greater faith in waking life but due to fear or anxiety is unable to conjure up this faith. Clouds may also indicate deep rooted fear or anxieties as well as wonders, hopes and desires of our internal self. The clouds symbolize these inner feelings. Clouds also bring life providing rainfall, and so can suggest there is new growth in some area of your life. Faith and Hope: We often associate clouds with heaven and having faith. Seeing clouds reveal a ray of sunlight could be an indication of staying hopeful about a situation. Finding Clarity: Clouds can give you a message that you either need to find more clarity and focus in your life, or it could mean, if the clouds are being lifted or moving away, that you are about to understand something more deeply. Changes Ahead: Clouds often are a sign of changing weather. From storms to bright and sunny skies. If the clouds are moving or you notice that the weather is changing in your dream about clouds, then you may want to ask yourself if there are any upcoming changes in your life that you might be nervous about. Feeling Confusion: Clouds can sometimes make it hard to see everything, especially when they are low in a fog. If you are dreaming of fog clouds, you may be in a situation where you need more information before moving ahead or you may want to proceed with caution. Fog clouds show that you may be feeling uncertain about something. Reaching Goals: There are many sayings about clouds and reaching goals. For example, "building castles in the sky" is an expression and saying that means you may not have realistic goals. Clouds can mean you are trying to reach a goal but are having a hard time in succeeding. Ask yourself: Is this goal realistic? Being Ungrounded: Being ungrounded means you are not facing reality in your day to day everyday life. You might be caught up in ideas or feel a lot of ranging emotions that change often. Another possibility is you are doing activities in your life trying to escape responsibilities or obligations. The clouds in a dream might be a subtle message that means, "come back down to reality". 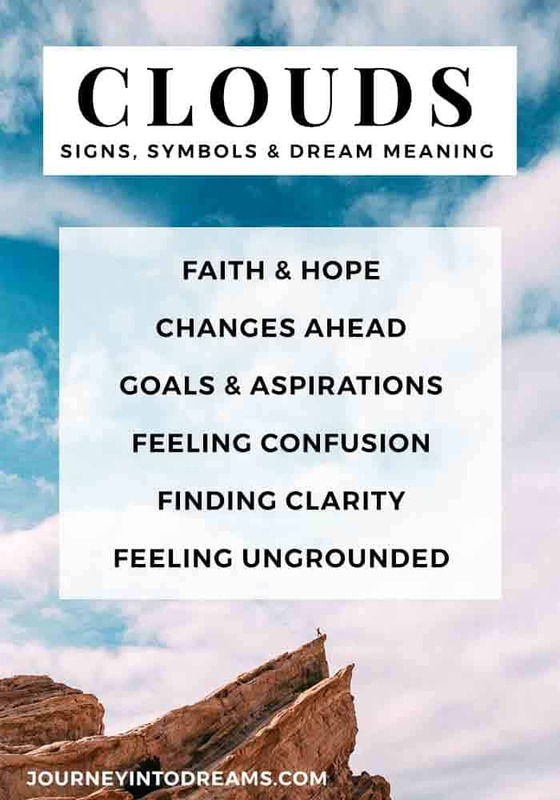 While the above meanings very well may help you understand what your dreams mean about clouds, it is also important to take into consideration what the clouds are doing in the dream and what types of clouds you might encounter. Paying attention to these details can help you better understand the dream meaning and what is happening in your life that is coming to the surface of your consciousness. The clearing up of beliefs and sensations, or pains, that have clouded your recognition of your innate being and held you back from the wisdom of your existence. Seeing the sunlight come through the clouds can also be a symbol to remind you to stay hopeful in your current life situations. Attitudes, fears as well as inner problems that cover your genuine self, your resource of power and also imagination. These clouds alert you of the current blockages to your core self and suggest that you must work through them to become who you want to be, not who everyone else wants you to be. This can either have to do with a feeling of on your own without the common constraints of physical body, of principles discovered in a materialistic culture-- or shedding touch with your day-to-day life and also running away right into imagination. A hidden influence is shaping your thoughts or feelings. It is necessary to note just what feelings you have regarding such clouds in your dream, as this brings a clue to what their message means for you.It is also important to identify the source of this new influence and decide whether or not it is positive for you. Clouds constantly move, and dreaming of clouds in motion may suggest that something important is entering your life and thoughts. It is important to take notice of the new events, experiences and opportunities coming into your life, because if you do not seize the moment and focus your energies on obtaining them, they may pass you by, just as the clouds in the sky keep moving until they are out of sight. Normally sensations of enlightenment or spirituality are at play if the dreamer sees puffy, white clouds. They could also symbolize your ability to to remain optimistic during challenging situations in your waking life. Dreaming of gray clouds often eludes to high levels of anxiety in waking life and/or feeling overshadowed by something. Such dark clouds are occasionally a warning concerning things we plan to do in the near future or are embarking on. They reveal we are not feeling good or certain about it and that careful thought must be given before going forward on this path. Seeing black storm clouds in a dream often indicates strong emotions you are having about a certain situation or person. They may also bring awareness of trouble brewing in your life in the very near future. Proceed with caution, live as peacefully with others as possible and make amends if you feel you have recently wronged someone, before they seek to take revenge on you. These could either illustrate being lost in your ideas, emotions or life path without a clear direction, or a solid change or feelings. Have you recently had a cloud dream? What do clouds mean for you as a symbol? Please feel free to share it, and what you think it means for your life in the comments below. I was outside a store and my favorite clouds were everywhere. The bright white clouds. The clouds came to me surrounded me,covered me, in my dream I was excited and happy because i have always been drawn to the brightest clouds. But in the dream, the pure white clouds vanished and in its place was a beautiful and I mean a Beautiful naked man. I was no longer wearing clothes either. And it was absolutely the best dream ever. I had a dream where I saw beautiful white billowing clouds over a landscape of fields of wheat waving in the breeze and then the clouds became a huge Angel that filled the sky and pointed at me?? I had a dream of a missle trail in the distance, then a low line of grey clouds came at night. They rolled in with a fast speed engulfing the street below as I was in a high level of a building. I became frightened as the building bagan to shift and I awoke in terror. my dream last night really scares me. i saw a rolling black clouds falling to the sea and become big waves that hit our house that was just on the sea shore.. 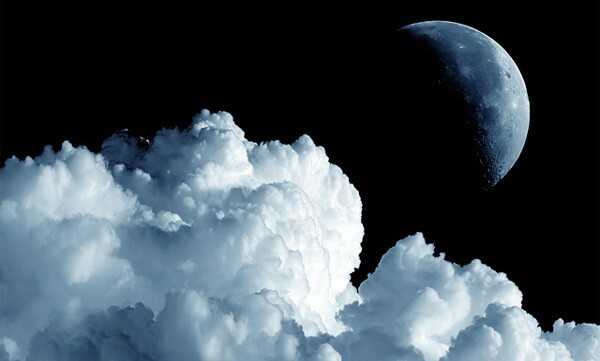 I dreamt of a pure black cloud that was moving incredibly fast and swirling rapidly unlike the other clouds behind it. They were grey and white. The Black cloud then stopped in from of me. It continued to swirl until it displayed an image. A skull. I don’t know what this would mean, but I’m assuming it’s got to do with death. I had a dream last night I was in some sort of room, but I was definitely up in the clouds. The clouds were white and puffy with long trendils hanging down. I have always wanted to touch a cloud, so of course I reach my hand out in my dream! It was the most brilliant feeling. It was dirty though once my hands got through, I could see the grit and dirt. This is the first dream I can remember having about clouds. I dream that I am chasing a stormy cloud and I never end chasing it.. It turns out that after I lost the chase, I never get wet and when I come back to where I used to be, people or things are really wet … Can you tell me the meaning of it? A 2 by 2 cloud fell on me. It was light but had weight and bit of texture and it was light grey. I dreamt of clouds that were the shape of gods hands and they were a beautiful color of an orange yellow sunset. Curious of what that could possibly mean.